Due to the emerging cooling possibilities at the micro and nanoscale, such as the fast heat exchange rate, the effort to synthesize and optimize the magnetocaloric materials at these scales is rapidly growing. 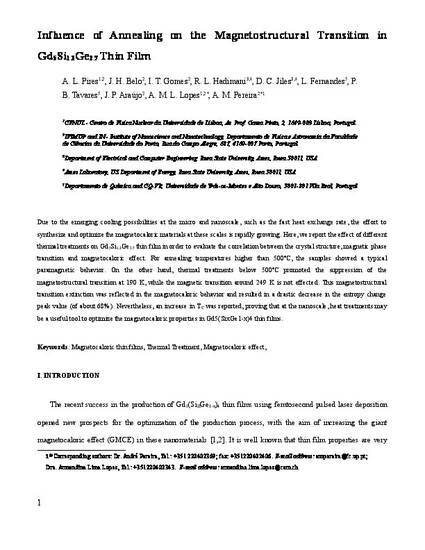 Here, we report the effect of different thermal treatments on Gd5Si1.3Ge2.7 thin film in order to evaluate the correlation between the crystal structure, magnetic phase transition and magnetocaloric effect. For annealing temperatures higher than 773 K, the samples showed a typical paramagnetic behavior. On the other hand, annealing below 773 K promoted the suppression of the magnetostructural transition at 190 K, while the magnetic transition around 249 K is not affected. This magnetostructural transition extinction imparts reflected in the magnetocaloric behavior and resulted in a drastic decrease in the entropy change peak value. Nevertheless, an increase in 25% of the TC and an increasing ΔTFWHM from 23 to 49 K of its operation temperature interval, ΔT, upon annealing, are crucial for future application in magnetic refrigeration. This is a manuscript of an article published as Pires, A. L., J. H. Belo, I. T. Gomes, R. L. Hadimani, D. C. Jiles, L. Fernandes, P. B. Tavares, J. P. Araújo, A. M. L. Lopes, and A. M. Pereira. "Annealing influence on the magnetostructural transition in Gd 5 Si 1.3 Ge 2.7 thin films." Materials Letters 159 (2015): 301-304. DOI: 10.1016/j.matlet.2015.05.029. Copyright 2015 Elsevier Ltd. Posted with permission.